According to the sources, the bus was full of soldiers while they were off to their weekend holiday. They were from the commando brigade. Check: Fog in Delhi Delays Trains. This year, the people of Turkey have already faced many dead bomb attacks so far. The public got more frustrated by the blast which occurred on Saturday. Kurdish fighters claimed a significant proportion of the attacks in 2016. In includes the Istanbul bombings which engulfed 44 lives while over 150 were injured severely. No group took the claim immediately. It causes a deadly violence outside the stadium of Istanbul soccer team Besiktas. However, Kurdistan Workers’ Party (PKK) claimed the attack. NTV said that the bus stopped at a right light on Saturday. After that, a car came near it and blasted. 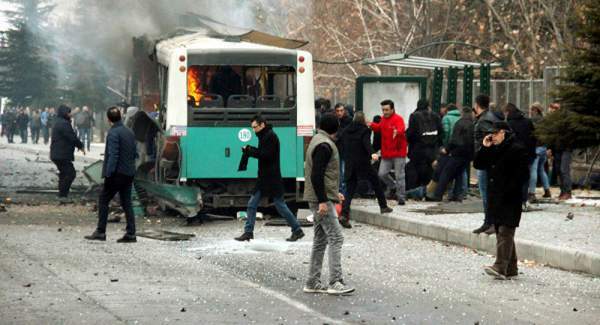 The explosion took place near the campus of the Erciyes University of Kayseri. This is the first time when Kurdish fighters have targeted security forces. The Turkey, the nation has been continuously facing security threats since a long time now. The main reason being the fight against the Islamic State of Iraq and the Levant group (ISIL aka ISIS) in northern Syria. Turkey is a member of the US-led coalition which is fighting against the armed group. Moreover, Kurdish militant groups are regularly attacking the Turkey. The armed groups are trying to overthrow the government from the last three decades to rule the country autonomously.